Whenever I go to the jungle I am stuck by the enthusiasm of the naturalists. I mean, how many people you know who are in their twenties and they wish to work away from the civilization where the nearest cinema might be 70 kilometers away? As I visited three national parks within a month I interacted with a lot of naturalists including Sangita S. Mani the woman naturalist at Taj Safaris. As they go the forest almost every day of the week I often ask then what have been their best wildlife sightings. Their answers amaze me. Here are three stories that amazed me, two from Madhya Pradesh and one from South Africa. 3. Falling Monkeys: Prayatna is a naturalist with Pugdundee Safaris. When I asked him what was his best sighting he told me he once saw a monkey dropping off from a tree because of the fear of a tiger. A tiger was standing beneath the tree, that itself made the monkey so nervous that he fell off. The tiger simply picked it up and walked away! Imagine if she Walked Towards the Jeep! 2. 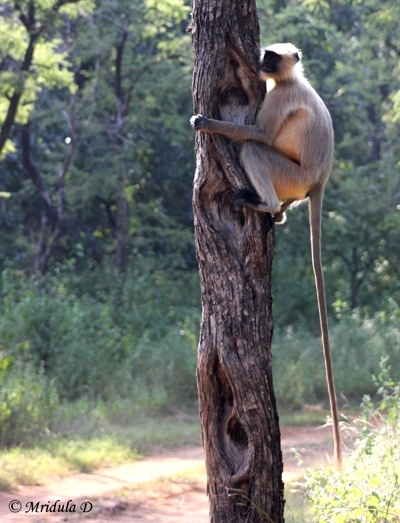 Too Close for Comfort: I was having a chat with Motiram ji at Pench National Park. When I asked him what was his best sighting he mentioned that one day he was driving with another Taj Safaris naturalist Koshtuba. 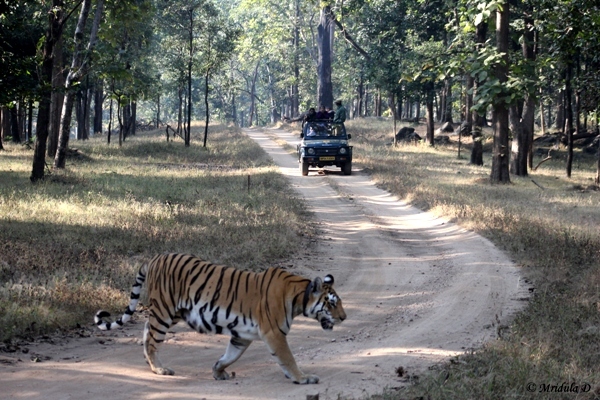 They expected a tiger crossing and accordingly parked their jeep. In other words just what I witnessed this time. Only that tiger had other ideas. Apparently it was marking territory and the jeep was parked next to the tree it wanted to scratch. So it stopped next to the jeep and started sniffing on the driver side! I was told that Koshtuba almost jumped into Motiram ji’s lap. I asked how long did this last? Motiram ji’s estimate was a few minutes but those minutes he said felt really long, they wanted it to end. There was another Taj jeep parked a little away from this scene and they were happily clicking pictures of the people in the stricken jeep. Now this is the kind of sighting I would not like to have! 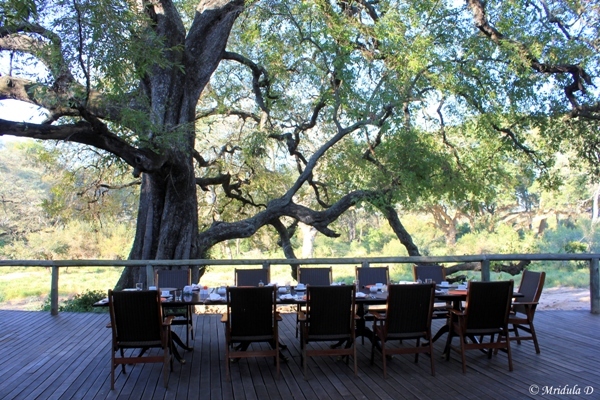 Can’t Imagine Lions and Buffaloes Fighting Behind the Dining Deck! 1. 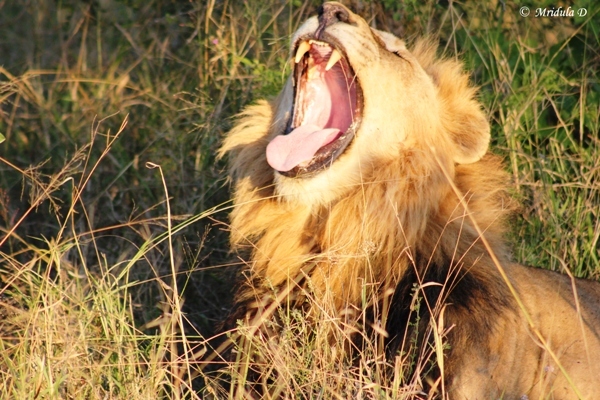 A Pitched Battle: When I asked my South African Safari guides Patrick and Erick about their best sightings, they told me another fascinating story. They said one day there were 7-8 lions at the back of the lodge (as you see in the picture aobe) and they had cornered a Cape Buffalo. However, 10-11 Cape Buffaloes arrived hearing the distress call of their mate and a battle followed. Erick said there were children at the lodge and they hated the cry of the buffalo under attack (I suspect so will I) so he had to take them to Manor House, another accommodation with the Tintswalo Lodges which was five minutes drive. I could see how disappointed he was for missing the action. He said it went on for a few hours but in the end the buffaloes didn’t let the lions carry away the injured bull. The bull later died of the injuries though. And here I am who thinks just sighting these cats makes for an amazing wildlife sighting! What do you say? What has been your most exciting wildlife sighting? The light was way too low but the sight was divine. When the dusk fell at the Manyeleti Game Reserve, our tracker was shining his torch around the bush and soon enough it caught the eye of an animal. And what an animal it was! Oh the thrill to see an African lion to walk so close to us and knowing that we were in safe hands to enjoy the experience. I consider this just a record keeping shot, after all the light was way too low to do anything decent with the kind of skills I have. But what a sight it was and I am glad that I have a record of it. The wildlife experience at the Manyeleti Game Reserve with the Tintswalo Safari Lodge has been beyond expectations, if you need a proof look below. We were that close to the lion. 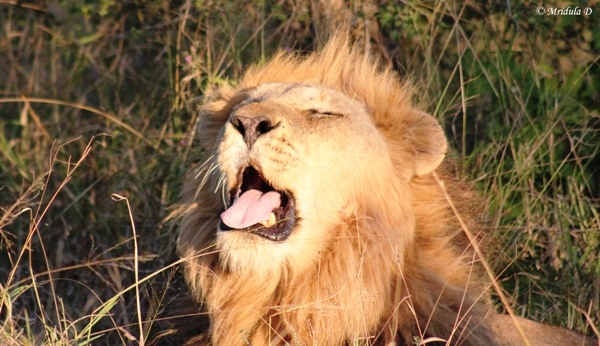 And contrary to what it looks like, this was not a roar, it was a yawn! I wonder why I told you that! Some of my encounters with the wild life in South Africa have been so close I actually shot with the normal (18-55 mm) lens rather than the 75-300. However the above picture has been shot by the 75-300 and you can see I almost chopped off the nose of the lion. 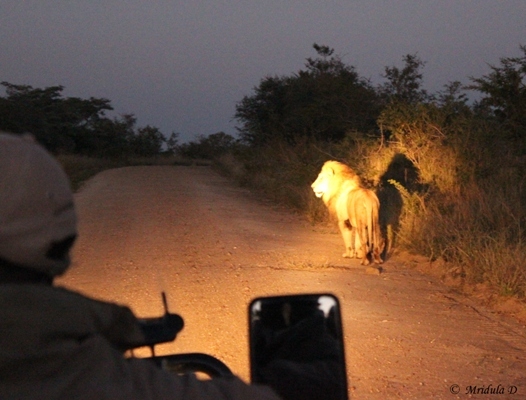 Our jeep was right next to the two sleeping lions, we were so close that we could hear them breathe. This one just lifted its head once or twice and then went back to sleep completely unconcerned about two jeeps full of human beings gawking at it at such a close range. We were told if the lions have a full stomach all they care for is sleep! These two were living proofs of it. The guides were clearly bored with the two sleeping lions but we tourists were so excited. So what if they were sleeping and there was hardly any action, they were lions and I rarely get to see them! Folks I have no internet in my room and I am typing this from the lobby and my colleagues are waiting for dinner. So have to go. Two more days in South Africa but the safaris have come to an end. I have to say you can never go back home the same person after visiting South Africa! I hope I will go back to South Africa again.